It’s the veg of the world and we know it, and I feel fine. Of course I do. I just had a delectable gourmet meal that was not only flavorful, it was also healthy and eaten in wonderful company in a relaxed, stress-free setting. What more could I ask for? Well, possibly to be able to cook this meal effortlessly all by myself and in such a beautiful apartment and kitchen, and maybe in the company of George Clooney and Ryan Gosling, but hey, I’m not too far off. The meal was a cooking class and I left with the recipes, I met interesting people that I will definitely stay in touch with and… well, I’m seeing “The Ides of March” this week with both Clooney and Gosling, does that count? 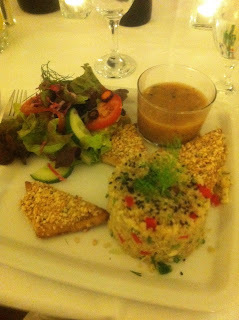 Located in Paris’ – très chic – 16th arrondissement, The Gentle Gourmet offers not only a hospitable B&B location for vegans, but also an international cooking school, cooking classes, convivial dinners and weekend brunch. Oh, and they’ve also singlehandedly founded Paris Vegan Day which now boasts over 5,000 visitors, but we’ll get to that later. The Gentle Gourmet holds true to its moniker – its food and its hosts are all quite gentle and very gourmet. My fellow Américaine, Deborah Brown Pivain opened The Gentle Gourmet B&B in 2009 and her ecologically-friendly, cruelty-free spot continues to attract vegans and carnivorous veggie-lovers alike. The lovely Deborah used to run a B&B complete with organic farm in Normandy, but gave up her seaside life to welcome word travelers to Paris. (So glad she did.) People with special food allergies who were afraid to travel before now have a haven in the City of Lights. GG offers gourmet daily breakfasts and dinners where both guests and Parisians or visitors can meet and mingle while feasting on organic, seasonal fare. 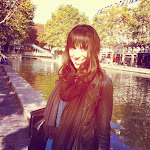 Deborah now runs GG with her two children Caroline and Alexandre and a new partner, a UK-born Australian Paul Farnhill. This enthusiastically vegan yet non-judgemental Franco-American family will make you feel at home as soon as you open the door to their cozy home. The kitchen is my dream come true – a huge space outfitted with top equipment, all against the backdrop of the Eiffel Tower. Well, almost. There’s a huge painting of the Eiffel Tower in the center of the room. While the GG team specialize in vegan interpretation of French cuisine from several different regions, during my visit, I was treated to some Vegan Fusion courtesy of another fellow American, Mark Reinfeld. Now, as you may have noticed from le blog, I have become quite the harsh food critic now that I’ve been spoiled by the likes of Alain Ducasse, Christian Sinicropi and friends, so my palette has become, as the French say, blasée. With that in mind, I must say that Mark Reinfeld’s meal was, well … one of the best I’ve ever tasted. (“With no dairy products or meat? She’s CRAZY!” Yes – I can hear you thinking out loud, scary huh?) Yes. Reinfeld’s fusion fare is refined and elegant, yet surprisingly easy to make and doesn’t involve esoteric ingredients like most “healthy” recipes I have found. He also adapts his recipes based on individual tastes and based on what is available. Can’t find macadamia nuts anywhere? (I certainly can’t – they have 800 different types of ham at every corner here, but no macadamia nuts. Seriously, Frenchies?) Not a problem – try cashews or almonds. Hate onions? Leave them out. 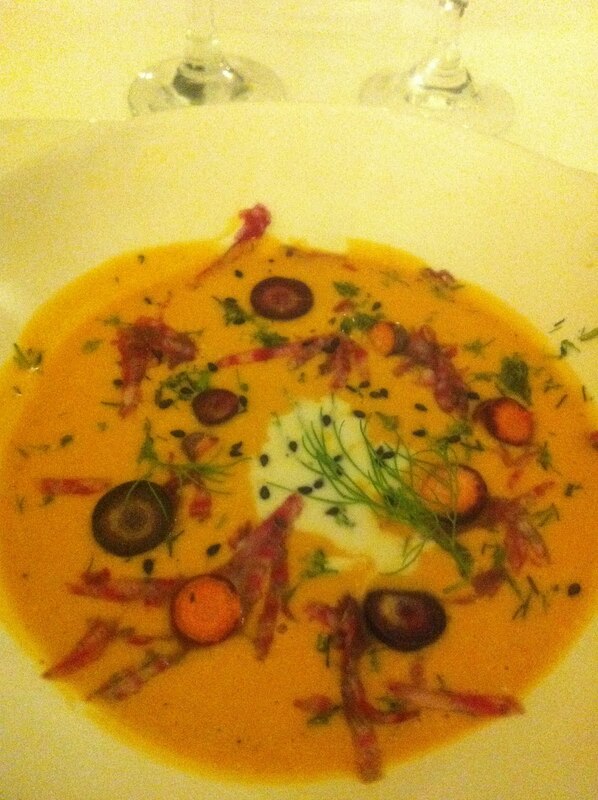 We started with a raw carrot soup that was a potpourri of colors, flavors and textures. The presentation was spectacular- it almost looked too good to eat until the spoon hit my lips and I tasted every ingredient, each bite a different mélange of the different aromas. Dessert was a platter of rich “choco bliss treats,” molten chocolate mixed with coconut, nuts and spices and cooled in the refrigerator. Not only were my taste buds tantalized, but I learned tricks of the trade for chopping, dicing, sautéing and flavor combinations. 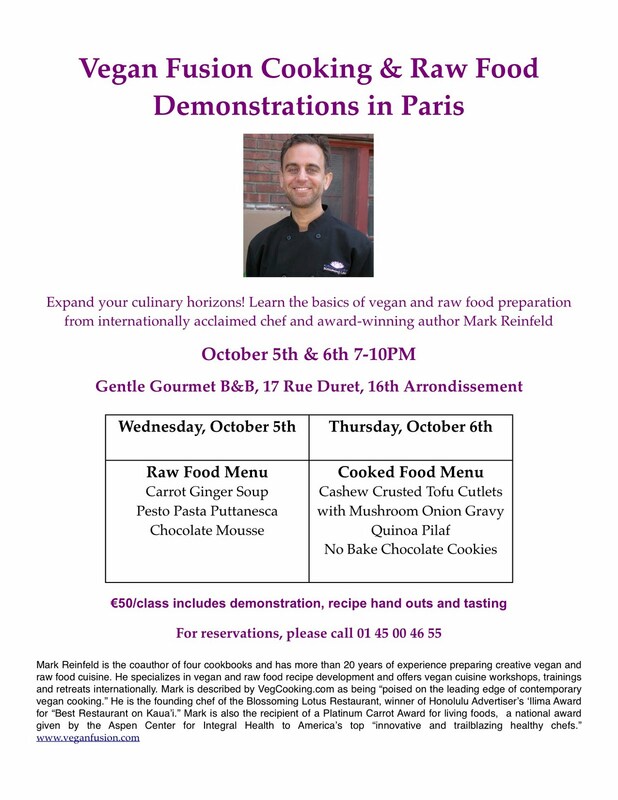 Reinfeld is a traveling gourmet, so if you can, definitely check out one of his classes in a city near you or, better yet, his 10-day vegan fusion retreats. Too busy to travel? You can purchase Reinfeld’s full cooking class online for under $100 that includes a how-to to all things vegan from technique tips to raw food to soups and salads to main courses and desserts. It’s really an amazing deal. Reinfeld has taken highlights from his cookbooks (Vegan Fusion, The 30-minute Vegan, Taste of the East, The Idiot’s Guide to Eating Raw…and more to come), mixed them with video lessons and put everything into a large file that tells you how to do everything from chop a carrot to blow your friends away with the most gourmet carrot soup they’ve ever tasted. The Gentle Gourmet is also a wonderful spot because it brings gentle and gourmet people together from all over the world. We met a lovely couple from England during our class and dinner, and there are always interesting people popping in from every continent. This weekend, the Gentle Gourmet-organized Paris Vegan Day will fete its third year with two days of animal-friendly events. 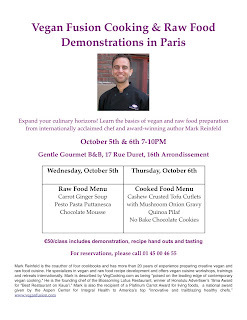 Guests chefs from across the globe will host free cooking demos all day on Saturday and Sunday, and visitors can participate in guest lectures on topics ranging from organic, vegan weddings to animals and politics, see a film screening or even a fashion show. Paris Vegan Day will play host to the first and unique Eco Vegan Fashion Show in Paris on Saturday night with NY choreographer James Koroni set to perform a modern dance before the show. Veg-friendly sponsors will set up stands throughout the location at La Bellevilloise. Last year’s event attracted over 4,500 people and this year, there are even more sponsors and events. Run by a French non-profit, Paris Vegan Day focuses on “the promotion, development and democratization of the vegan lifestyle,” according to its organizers. Vegan meals will be available for lunch and dinner or brunch (but book in advance! resa@labellevilloise.com) in addition to snacks from sponsors scattered throughout the day. 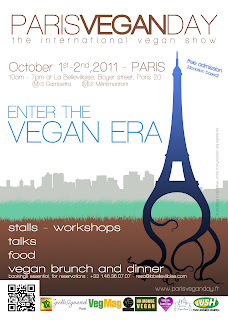 Paris Vegan Day isn’t only about the food. 100% cruelty-free, animal-friendly cosmetics, clothing, wine and spirits, green products, animal causes, environmental initiatives, ethical practices, sports, health and games will also be showcased. I’ll definitely be popping in so hope to see you all there!